Each organism has a unique genetic code which is determined by the sequence of the DNA chemical letters, C, G, A and T. A section of code that is responsible for a specific characteristic is known as a gene. These sections of code can vary from a few hundred letters to over a million depending on the gene. Genome editing is the process of changing the genetic code of an organism by inserting, deleting, modifying or replacing sections of DNA. Gene editing uses specialised tools to cut away a section of DNA at a specific site and sometimes insert a new section. This can be employed to mend DNA by correcting mutations that cause disease, to insert entirely new bits of DNA giving an organism new characteristics, or to discover the function of specific genes. Gene editing has already been performed on animals, plants, bacteria and even humans, but it is still in its infancy. However, recent discoveries, such as CRISPR/Cas9, have made it cheaper, quicker and more accurate. Genome editing can be achieved in a variety of ways, but one of the most promising newer technologies is the CRISPR/Cas9 system, which has been likened to the ‘find and replace’ function used in document editing. Cas9 is an enzyme that has the ability to cut DNA, which is often likened to ‘molecular scissors’. It is guided to the correct place by ‘guide RNA’, which is similar to DNA, and has the ability to stick to a section of DNA if its genetic code is complementary. By designing the guide RNA to stick to a gene of interest we can guide Cas9 to cut the DNA only at that site. 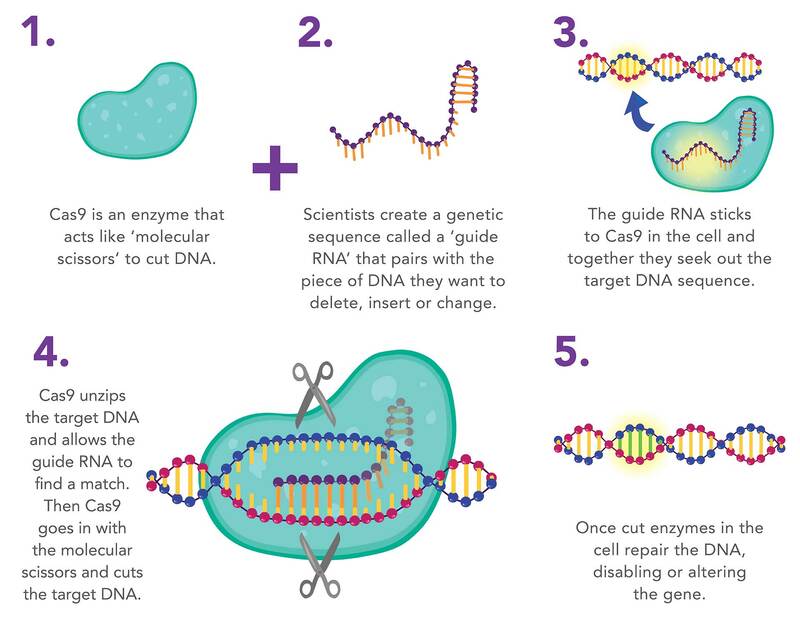 After the DNA strand is cut we can use the natural DNA repair mechanisms of the cell to insert a new gene or reconnect the DNA where a gene has been removed. The CRISPR/Cas9 system enables cheap and rapid editing of genes with greater accuracy than previous methods. Mosquitoes have the ability to carry and transmit many deadly diseases that are responsible for millions of deaths and billions of pounds of economic losses every year, particularly in developing countries. Pirbright carries out research to understand how genetically modified mosquitoes can be used for the control of mosquito populations to prevent diseases of both livestock and people. One of the most promising control techniques is known as a gene drive. This is where the mosquito genome is modified to decrease their ability to breed or carry infections, and this modification is favourably spread into a population at a faster rate than normal inheritance. As these modified mosquitoes mate with the wild population, up to 100% of the next generation inherit the modification whereas normal inheritance would give only up to 50%. This means the number of modified mosquitoes that need to be released to make an effective change to the population is much lower than other strategies. Researchers in the Arthropod Genetics group are particularly interested in developing safe, reversible gene drive designs that will modify a target mosquito population but remain local in their effects. Genetic modification can be employed to help develop new vaccines. For example, we can use genetic engineering to take genes from a virus that causes disease and insert them in to a safe virus such as vaccinia. When a host is injected with the modified vaccinia virus it will then develop immunity against the disease causing virus, without risk of infection. Traditional methods for performing such modifications are time consuming and unreliable. At Pirbright, several research groups are now using the CRISPR/Cas9 system for vaccine development which makes the process quick, simple and efficient. This technique is being used by the Viral Oncogenesis group to insert multiple genes from different viruses into a single vaccine to provide protection against multiple diseases. Immunogenetics explores the link between the immune system and an animal’s genes. Understanding the genes that control livestock immune responses can help us improve their resistance to disease. Experts in our Immunogenetics group have been working to understand the genes that control natural killer (NK) cells; one of the first lines of defence against viral infection. NK cells detect the presence of a virus using special receptor proteins on their surface. These attach to signalling proteins on cells that have become infected, triggering the NK cell to kill the infected cell and activate other arms of the immune system. Our scientists have been researching the genetics behind this system and in doing so hope to improve the resistance of cattle to disease, either by informing breeding practices to help improve their innate resistance, or by designing and selecting vaccines that trigger NK cell functions.